Strategic Goals: The Society’s strategic goals cover eight broad areas of work: governance excellence and sustainability; delivering value to our members and chapters; supporting the profession of PALTC medicine through timely education, training, competency standards, certification and clinical tools and resources; serving the interests of PALTC patients, residents and families through direct public policy advocacy and external relationships and coalitions; and defining quality in PALTC. Major Programs: The Society carries out its mission and strategy through its major programmatic activities, which include a unique intensive training course, the Core Curriculum on Medical Direction, and a series of live, face-to-face trainings, as well as online webinars and teleconferences. The Society holds a large Annual Conference in the spring of each year in various locations around the country, drawing some 2,000 physicians and other practitioners, as well as representatives from industry, academia and government. The Society has developed Competencies for Post-Acute and Long-Term Care Medicine, and now offers an online training program on the cornerstones of knowledge needed to practice in the PALTC setting, the Competencies Curriculum. 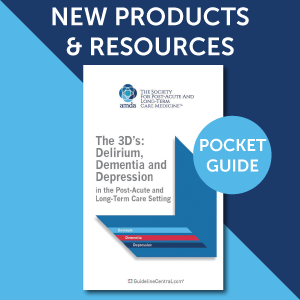 In terms of clinical resources, the Society develops and disseminates its Clinical Practice Guideline (CPG) series as well as a wide variety of information toolkits and guides. The Society’s public policy and advocacy program engages the major regulatory agencies of the Federal government as well as legislators and committees of jurisdiction in influencing public policy to enhance the practice environment for PALTC medicine and the patients, residents and families our members serve. Click here for a .pdf version of the 2016-2019 Strategic Plan. Goal 4. Promote clinical education and competency to optimize system-wide, individualized, goal-directed care.